We had to be out of our apartment in St. Petersburg by noon and our train didn't leave until 23:55 (5 minutes before midnight). We dropped our bags in the locker room at the train station and wandered back to the Liverpool pub where I updated the web page. 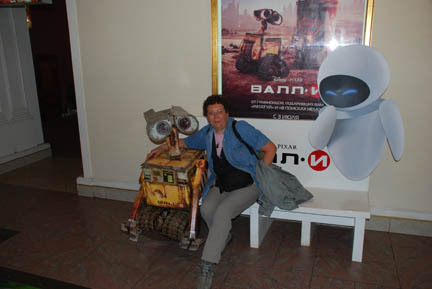 Then we went to see the movie "WALL-E". We had been led to believe by the reviews we had read that the dialogue in the movie was mainly computer talk between the two primary robots. It wasn't, there was quite a bit of verbal dialogue between the cartoon humans also. It was interesting to note that the version of the movie we were watching was not just an American version dubbed in Russian but a version that was produced for Russians. There were billboard signs in the background of some scenes that were written in the Cyrillic script that we are sure would be in English in the American version of the film. After watching the movie Kathy had her picture taken with the stars. Finally our train was called and we climbed aboard. 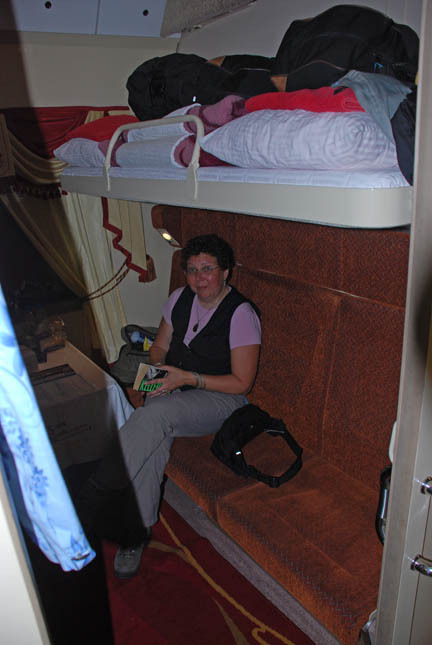 We shared a four bunk compartment with a Russian couple from Moscow who had taken the weekend to go museum visiting in St. Petersburg. The couch on the bottom folds down to a bed and the bags on the top bunk are stowed underneath it. The other couple both snored and we didn't get much sleep. We are due in Moscow at 08:00 and arrived on time. We met our driver and he took us to our apartment. Our first day was spent getting acquainted with our neighborhood, we have a MacDonald's two blocks away! I'm sure we can avoid it! We also have a nice grocery store only one block away and a park nearby. We are on the second floor with a view of a large tree. There is a noisy construction site next door, but they only work daytime and we are gone most of that. 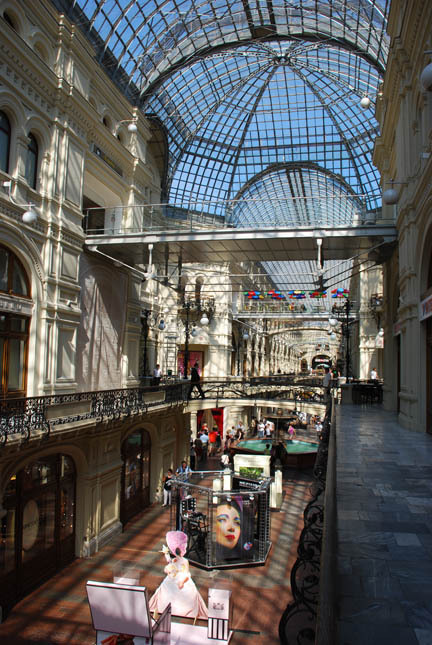 We went first to Ulitsa Arbat, the old street of poets and writers that today is a tourist destination of shops, both high and low end, and cafes. We bought some souvenirs, two nice Matryoska dolls (nesting dolls) and a nice birch-bark carved jewelry box as well as some junk. 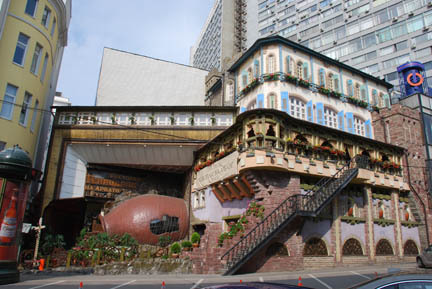 This is a restaurant-hotel along there, the entrance is through the large brown "jug" laying on its side. Very strange! 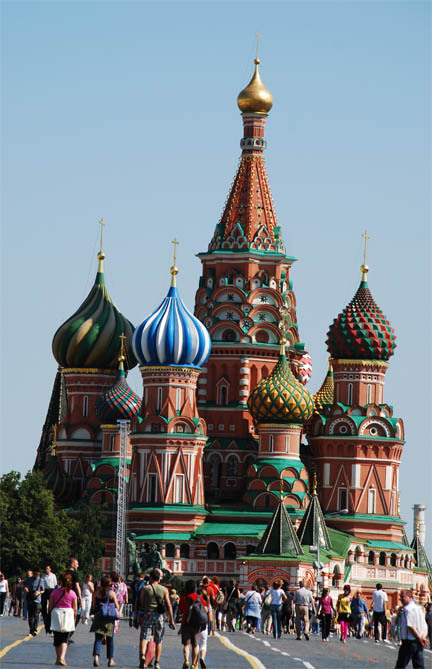 But what every tourist that comes to Moscow has at the top of their "to visit" list is Red Square. Red Square gets its name not from the Communist Era. The "red" has nothing to do with politics, it derives from "krasniy" the old Russian word for "beautiful" which came to mean "red" because of people's hunger for bright color during the long, drab winter months. 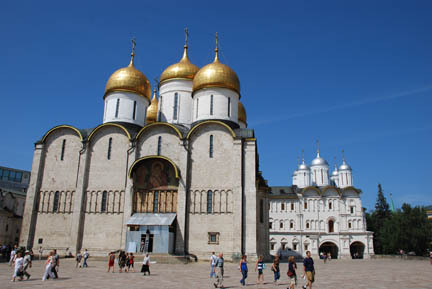 The square was created at the end of the fifteenth century when Ivan III beautified the area by clearing out the wooden houses and trader's stalls that had grown up outside the walls of the Kremlin, which date from the 12th century. On the left is St. Basil's, across the back is the Kremlin with Lenin's Mausoleum the dark lump in front of it and the Historical Museum on the right. Behind the trees to the left, facing the Kremlin, is the huge GUM department store. The square was closed off and they were setting up a stage at the far end when we were there. We arrived in time for the 10:00 opening of Lenin's Mausoleum and got in line. First we had to leave all cameras, including phone cameras, packs, pocket knives, etc. at the lockers in the Historical Museum and go through metal detectors by that tree at the right end of the wall. Even though the Soviet Era started by Lenin is over they still hold this site with reverence. Two by two we walked along the wall past the graves of famous Russians to the entrance of the Mausoleum where we descended to the bier Lenin rests on, with young, pimple-faced guards watching us all the way. They may be young but they take their duty seriously. All one could see of Lenin were his hands and head, and they had a very waxen look. Some say he has been replaced by a waxwork, others claim it is the embalming process, which is repeated every 18 months, during which time this site is closed. After returning to the surface we continued along the wall towards the far end where we were guided across the square and released. We had to then walk from down near St. Basil's back to the Museum to get our bags and cameras, but were not allowed through the square, so we walked through the huge GUM store, around the Historical Museum and finally got our bags. Then we walked back around the way we had just come, around the Historical Museum, through the GUM department store again and on towards St. Basil's. The GUM store is full of individual shops just like an American mall. There are three of these glass-covered aisles and four three-story rows of shops. These are very expensive high-end shops selling jewelry, watches, perfume and clothes. We didn't buy anything! Finally we made it to St. Basil's, the famous landmark of Red Square just in time for its 11:00 opening. I have to say that after having visited the Church on Spilled Blood in St. Petersburg we were disappointed with St. Basil's. It is somewhat similar with its domes but also very different. It has no mosaics and the inside is a rabbit-warren of small rooms that are called churches, each with its own name. Essentially each dome-topped tower is a separate building and is considered a separate church but with common walls and with narrow hallways and stairs between them. One of these "churches" dating from the 16th century, The Church of the Holy Trinity, was 21 meters high but only 3.5 by 6.5 meters in floor area. In American measurements it is about 70 feet high and 11 by 20 feet of floor. 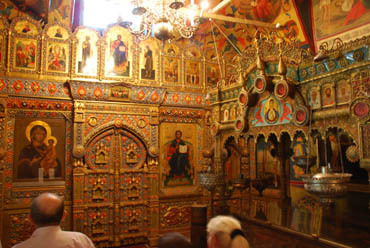 An interesting building with painted walls and the main church (pictured above) with gilded icons covering the walls. St. Basil's sits in the middle of one end of Red Square and at one time Stalin was going to demolish it because it was blocking access for his troops and weaponry to parade through the square. But he was prevailed upon to save it. Then we walked back the way we came, through GUM one more time and around to the Historical Museum. (I think we are beginning to wear a groove into the floor.) 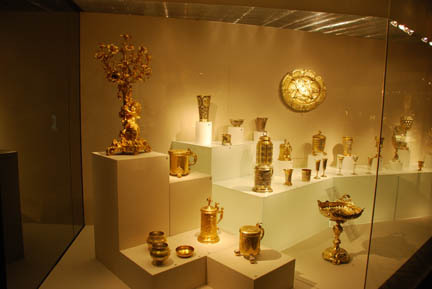 The museum is full of the treasures of Russia. There was lots of gold and silver. There were Icons hundreds of years old. (A Russian Icon is a religious symbol. It is a painted picture of a religious personage, like a saint, that has had a gold and/or silver cover put over it with a cutout just the right shape for the person to show through. The metal is engraved and shaped and decorated including a three dimensional halo for the person.) There were relics from a thousand years of Russian history here. Then we went into The Kremlin (kremlin means fort and every town had one). 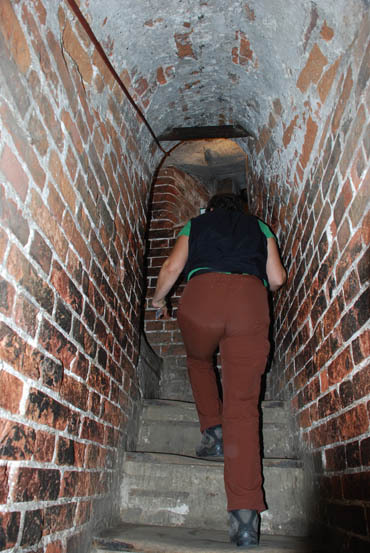 Inside are several government buildings, which were off limits, and several more churches, which we could tour. There was also the "Tsar Cannon". The only time it was ever fired was to shoot a man's ashes back to Poland. 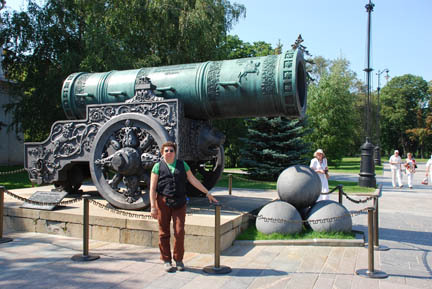 The cannon weighs 40 tons and shoots a ball 890 mm. (3 feet) in diameter. When we left the Kremlin we wandered through the area and into the square in front of the Historical Museum (on the opposite side from Red Square) where we found this entrepreneur. 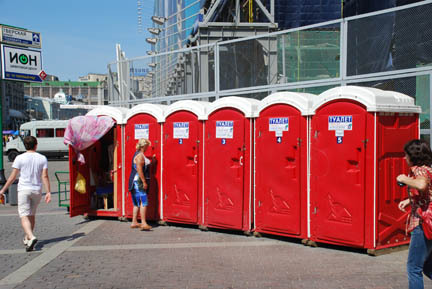 The lady in blue has taken over the left-hand porta-potty as her "office" and charges you for using one of the others. In turn she keeps them clean and stocked. I don't know if she is licensed and approved or if she is just making money any way she can. But she is not the only one, every row of these we saw was in someone's care and could not be used without paying the person. Both Arbat street and Red Square were within walking distance (less than 2 miles) of the apartment but Gorky Park required a trip on the Metro. So we got out the map and figured out the route and the names of the stops (we had to switch trains midway) in Russian. 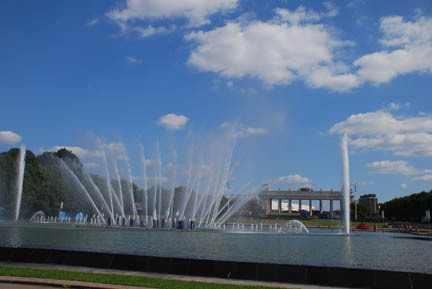 The highlight of the park was this huge fountain which had the water dancing to music. The entrance is in the background and it all was built in 1955. It is less a "park" and more of an "amusement park" than I thought it was. 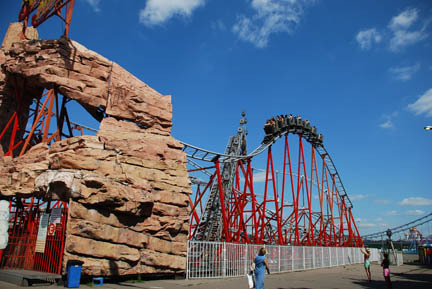 It reminded us as a much enlarged and younger version of Tivoli in Copenhagen, Denmark. It has fewer high-end restaurants and more rides but is the same idea. We sat on a bench in the shade and ate our lunch while we watched young families walk by with grinning children, just like at Disneyland. Then this walked past us, coming from behind us. I almost dropped my lunch in my haste to get the camera out. 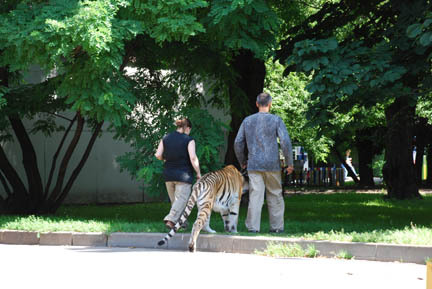 Its not every day you see a full grown tiger on a leash being walked through the park. I think they are park employees, but where they are taking the tiger I don't know. Later that day we walked back out the front and across the road to a sculpture park. 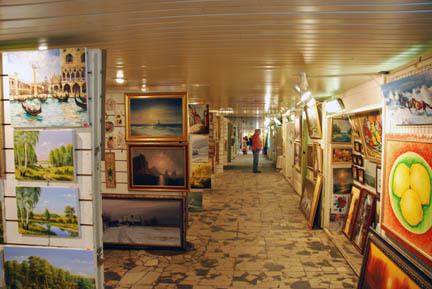 The road was 6+ lanes wide and had a pedestrian underpass filled with artists displaying their art. Along both sides of the sculpture park there were even more artist's works. But we began to recognize some of the art as repeats of works we had seen in one of the other areas. All were handmade but not all were the work of the person standing there. 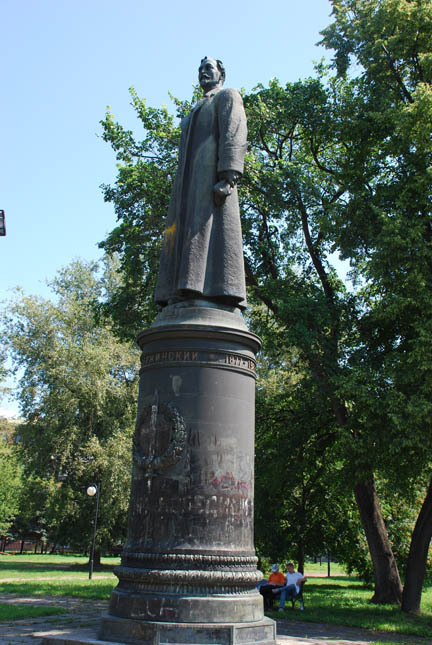 In the park was a stature of Lenin that had been moved there. It was not being treated with the same reverence that his mausoleum. There is yellow paint on his coat and evidence of graffiti that an attempt had been made to remove. On the subject of graffiti, the cities of St. Petersburg and Moscow have very little graffiti. There is some but not to the extent of other cities we have been in. And litter is minimal too. We have seen Russians actually walk across the sidewalk and throw the candy wrapper into a trash can instead of just dropping it as they walked along, a very common sight the farther south one goes in Europe. These cities may be run down and looking very worn but the citizens are doing their part to keep them clean. The buildings facades, sidewalks and streets are in poor shape. No money was spent on them for a long time. (I wonder if the government was spending everything on the Arm's Race with the West.) They are making us for lost time now with many buildings and roads under repair. 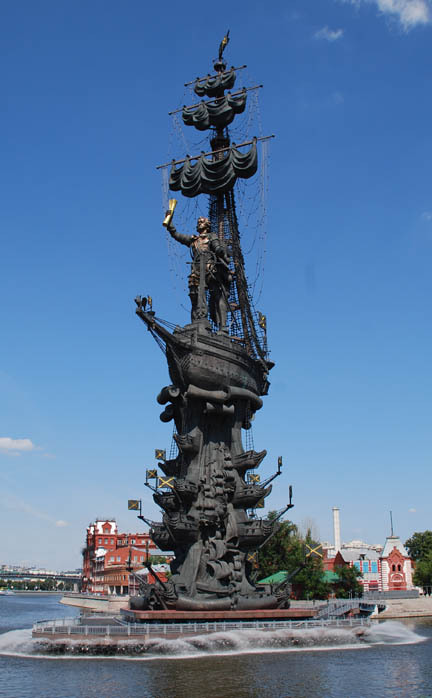 Lastly was a look at the Peter the Great Monument on the island in the river. This monument is HUGE! It is 95 meters (300 feet) tall and the galleon that Peter is standing on is life-size. Needless to say he is a lot bigger than life-size. The base has the bows of several more galleons protruding from it. The ship's flags turn in the wind. This is the brainchild of Mayor Luzhkov and his favorite sculptor, Tsereteli, and is reputed to have cost eleven million dollars. It is reviled by Muscovites as the worst of the works foisted by these two on the city. Tomorrow we must leave Moscow and return to Helsinki. 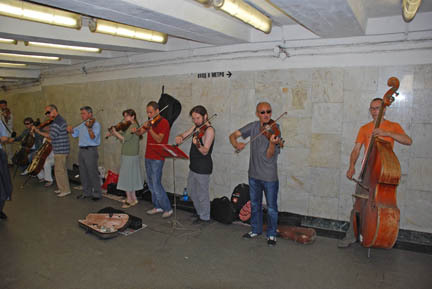 One of the highlights of our time here has been the "Metro Music". One or more musicians will put out the donation box and play for your entertainment. Not all are as good as this group, they had drawn quite a crowd. You could say that they were "jamming" up the passageway. It was worth it and they were making money too. We take the 22:50 (10:50 PM) train to Helsinki tomorrow, but we have to be out of the apartment far before then. So we will again leave our bags (which are getting heavier every day) in the locker room and try to find a pub with wireless connection in the area of the train station. If you're reading this we were successful.